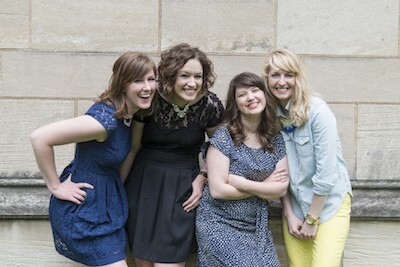 Authors of “Pittsburgh Chefs Table.” From left, Laura Zorch, Sarah Sudar, Mandy McFadden and Julia Gongaware. I admit it, I love to collect cookbooks. I buy them and I read them like I would any other book that I own. I have been doing it for many years now and have quite an eclectic collection of books. I am always looking to expand my cookbook repertoire. I was very excited when I saw that the Pittsburgh Chef’s Table: Extraordinary Recipes from the Steel City, was finally published. It is the second book written by the bloggers from eatPGH. This book is magnificent! The pages are filled with incredible recipes and mouth-watering pictures from some of the best chefs and restaurants in the city. The book is more than just a cookbook, it is a culinary map of the city. It showcases the epicurean diversity that has always made Pittsburgh a great city to eat in. The chef’s stories are witty and engaging. They provide an insider’s perspectives into some of the best eateries in and around the city. What stands out is the assortment of the chefs and stories that are in it. The spectrum runs from top tier eating establishments to bakeries, pubs and gastro pubs, cafes, deli’s and food trucks. The recipes that the chefs have shared range from the simple to the sublime. Many of the recipes can easily be duplicated by a home cook. There are a vast array of them so readers have a variety to choose from. Showcasing the gastronomic potpourri in the city is definitely a theme in this book and it is evident in the recipes that are presented. There are the familiar recipes for foods like Beans and Greens, Macaroni and Cheese, Pot Roast and Mashed Potatoes and Tomato-Fennel Soup and Chocolate Bread Pudding. If you want something more challenging there are recipes for Pâté De Champagne, Roasted Butternut Squash Chocolate Ravioli with Lobster Basil Cream Sauce and Duck Cannoli with White Chocolate Cardamom Beurre Blanc, Candied Orange Peel & Pistachio Dust. There are appetizers, main course, desserts and cocktails recipes to choose from. This book covers it all. The women of eatPGH have created something special with this book. It is an amazing cookbook and coffee table book; it a visual depiction of the diverse food scene happening in Pittsburgh. The food culture is changing in the Steel City, it is morphing and ever expanding. Many of these new chefs are putting Pittsburgh on the map and are making a name for themselves in the culinary community. Yes, Pittsburgh will always have their traditional foods: Pierogies, Primanti Brother Sandwiches, Iron City Beer and Chip Chopped Ham. These are the foods that helped define the city and the people in it. However, Pittsburgh is just so great that you can have these staples and at the same time have a blossoming food scene. It is a great time to be a foodie in the Steel City. 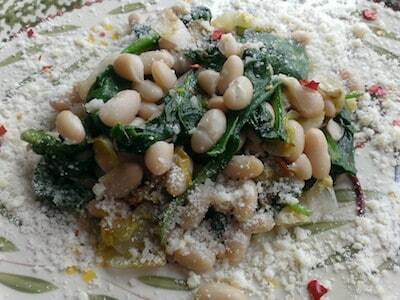 In the book, I was instantly drawn to the Pittsburgh classic Italian American dish, Beans and Greens. Growing up we only made a dish like this but we called it Escarole and Beans. We only used escarole- no other greens in our dish and small white beans. Also our dish was a soup, or soup like and served as a soup course. When I first arrived in Pittsburgh, it was then I discovered my beloved Escarole and Beans had a new name: Beans and Greens. I discovered that this dish was it not a soup and it was served as a side or as a meal. It has a variety of greens in it and that cannellini bean were used in it. What I loved most about the people in Pittsburgh, they were bold and took my beloved childhood dish to another level of deliciousness- sometimes cured Italian meats or Italian sausages were added. After my first bit of this dish, I became hooked. It is a quintessential Italian peasant dish; simple, minimal ingredients cooked together that will give you a delicious flavorful meal. I do adore this classic dish and I will go out of my way to get a good plate of it. Pittsburgh has so many iconic foods, but to me Beans and Greens is one of the best foods that this city has to offer. I make my own version of Beans and Greens, but I decided to make it Pittsburgh style. I used a combination of fresh baby greens (kale, spinach, chard) and escarole, the blend of these really makes the dish flavorful. I like the small white beans, but cannellini beans may be substituted. I small amount of stock is required, but if you want to make this soupier add more stock. If you have some cooked Italian Sausage, throw it in because everything taste better with sausage. This is a very forgiving recipe, so have fun with it. It is a quick meal that is perfect to make anytime. Heat olive oil in a large pot over medium low heat. Add the whole garlic until the garlic becomes golden brown- remove and discard the garlic. Add the greens and stir to coat with the oil. Add the minced garlic and the red pepper flakes, sauté for a minute or two. Sauté, stirring occasionally, until the greens begins to cook down. Now add the beans and cook for a few minutes until beans have absorbed some of the oil. Add the stock, season with salt and pepper and cook until the beans are heated. Garnish with the grated cheese. Garnish with more grated cheese and red pepper. Serve with a slice of good crusty Italian bread to make it a complete meal. Nicky D Cooks is the owner and operator of Nicky D Cooks Authentic Handcrafted Italian Biscotti and Pizzelle. Her website can be found at http://www.nickydcooks.com. Also, check out her Facebook page @ http://www.facebook.com/nicky.d.cooks for more information and great recipes.